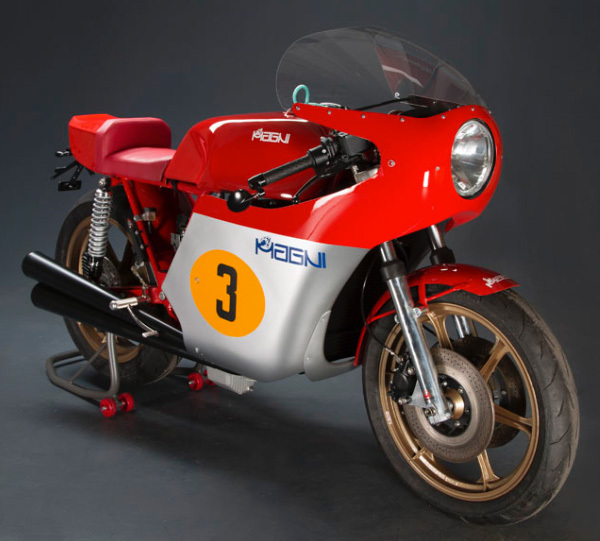 When storied Italian motorcycle manufacturer MV Agusta dropped out of racing and disbanded their department in 1976, the former Racing Team Director Arturo Magni decided to go solo and create his own line of bikes. But he didn’t completely abandon his MV Agusta roots, instead utilizing their bikes as the foundation for his racing machines. 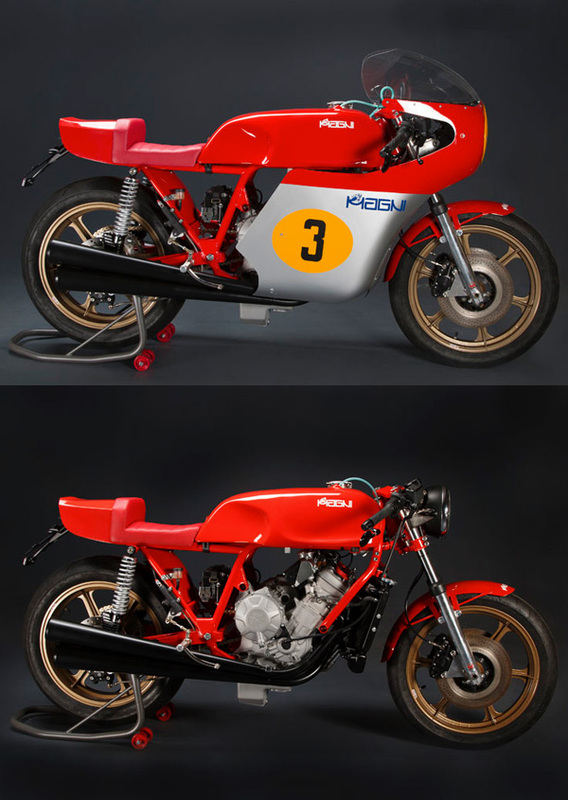 The legendary engineer modified the bikes by boring out the 750cc engines to 860cc, swapping out exhaust pipes and adding chain-drive conversions. 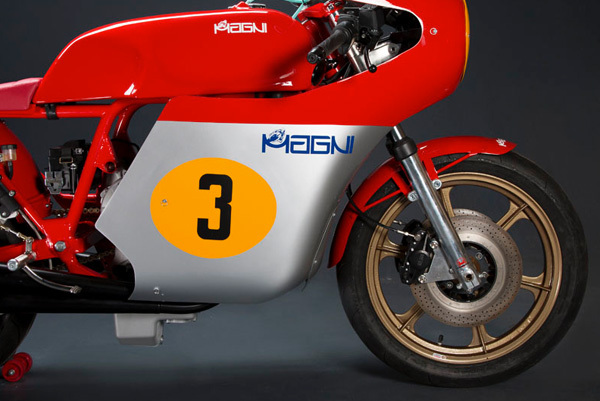 The results were exquisitely engineered machines that won seven consecutive championships with Giacomo Agostini piloting. 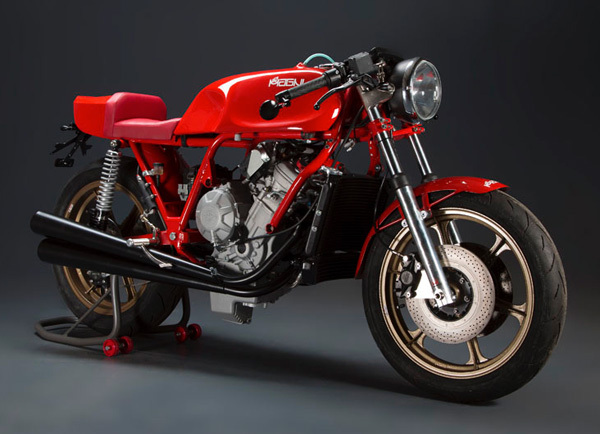 Now, under the careful direction of Arturo’s son Giovanni, the Magni factory is firing up once again with a reanimation of their gorgeous bikes called the Filo Rosso. 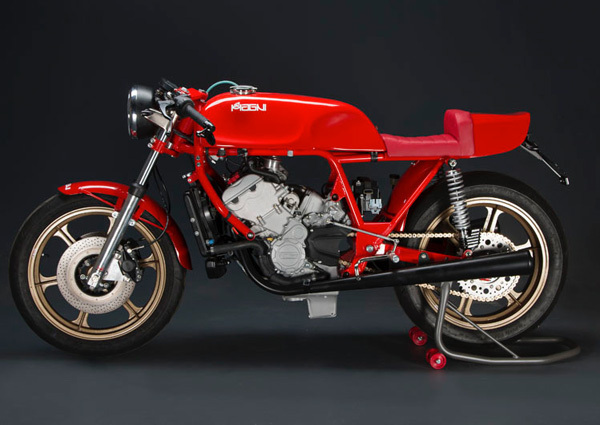 The Filo Rosso mimics the drool-inducing lines of the late ‘70s Magni motorcycles via hand-beaten aluminum bodywork, but adds plenty of modern tech to assure you don’t have to spend every weekend noodling with ancient, obsolete mechanics. As did his father, Giovanni is using an MV Agusta engine as the foundation of his creation and tucks it into a double-cradle frame. The 3-cylinder Brutale 800 engine generates 125-horsepower, a ton of power for a bike that weighs in at about 320 lbs (145 kgs) — offering plenty of get-up to duke it out with most modern street bikes. But a rocket that can’t stop is more dangerous than your pedestrian scooter, so Magni is making sure all the rest of the mechanics are in order — starting with twin-disc Brembo brakes. New Dunlop tires, 18” magnesium alloy wheels, Cerianis forks and a push-button starter finish off the thorough modernizing. Of course what will have your entire neighborhood — and everywhere you choose to ride — suffering from apoplectic fits of envy is undeniably the design. The Filo Rosso is absolutely stunning, either with the red and silver aerodynamic fairing or without. Although the race fairing is more salient and “retro”, the naked “café racer” trim is the stuff of wet dreams. So far ahead of its time when originally made, the naked café setup actually looks plenty modern. The boxy silhouette is absolutely distinctive; you’ll have riders everywhere flipping up their visors and staring in disbelief. No word yet on pricing, but don’t expect the Filo Rosso to be cheap. But since the production will be extremely limited, you can believe it will be worth every cent.